Two of the three Democratic gubernatorial candidates have now paid homage to the Mighty Mouse, er, Moose, of Vermont’s political establishment: the Progressive Party. The goal is to appease the Progs, gain their support, and keep them from running a candidate in the 2010 race for governor. State Sens. Susan Bartlett and Doug Racine have kissed the Progressive ring, so to speak, but Secretary of State Deb Markowitz has not. Racine spoke to about 50 Progs in May; Bartlett, to about 20 this past weekend. How’s this political détente working out for the Democrats? “Oppose relicensing the state’s lone nuke plant, Vermont Yankee, beyond 2012. Hmmm. Maybe one of the candidates will sign on to two out of three? We’ll see. “I think we have a lot in common on these issues,” said Racine, noting only slight differences between his views and those of the progs. Sounds like a threat. Might Progressive-turned-Independent Anthony Pollina return to the Progressive fold once he liquidates the now-defunct Vermont Milk Company? He does need a job. The possibility of a Prog in the race has got to be welcome news for Republican Gov. Jim Douglas, who always benefits from Vermont’s left-wing infighting. If this keeps up, he could win a few more terms. That’d make him Vermont’s longest-serving governor. Period. The plan was concocted in secret by fewer than four lawmakers — a mix of Democrats and a Republican — and members of the Douglas team. Don’t you just love government transparency? I know, I know: How can an elected official speak his or her mind with the press hanging on every word? Just ask state enviro officials who attended a closed-door meeting a couple weeks ago with the folks they regulate. Maybe this is a trend. The legislative Joint Fiscal Committee will convene a public hearing next week to get a sense of what the unwashed rabble likes, and dislikes, about the proposal. Regardless of public input, Kraus hopes the committee — composed of top members of the legislative money committees — will seek more detail on the “labor savings” item before approving the measure. This is well-trod territory for state employees: Democrats giving Douglas the green light to cut workers based on a monetary target, not on ways to make government work more efficiently. The result? A body count, pure and simple, notes Kraus. And the bodies are piling up like cordwood. In all, the legislature and Douglas administration have cut 620 jobs from the state payroll through a mix of “vacancy savings,” early retirements and layoffs. The proposed recision plan of another $7.4 million in cuts, coupled with vacancy savings contained in some of the budget cuts, would amount to as many as 300 more jobs eliminated. Kraus said the Douglas administration, despite its promise, has not met with labor leaders to work out a cost-savings plan that trims the state budget without putting people out of work. “They’ve basically said that even cost-cutting ideas all have to go through Michael Marks,” noted Kraus. Who the heck is Michael Marks? He’s a private attorney who happens to be the administration’s lead labor negotiator. Douglas’ team and VSEA will soon sit down to hammer out the next two-year contract. Just in time for Labor Day. Following Flanagan— Did I ever pick a good week to go on vacation! The day after breaking the news that State Sen. Ed Flanagan was suspended from the Greater Burlington YMCA for allegedly masturbating in front of other patrons, I was packing for the family’s annual camping trip to the coast of Maine. By Thursday morning, July 30, I was on the road to our secure, undisclosed location near Acadia National Park. There I stayed until August 6, when we rolled back into Burlington. What happened while I was gone? Flanagan continued to deny the allegations, but at the same time apologized for doing anything that might have been misinterpreted while he was naked near the locker room. There was also predictable hand-wringing from his senate colleagues and members of the media about Flanagan’s traumatic brain injury and its effect on his ability to hold office, run for higher office, and conduct strenuous gym workouts. Several news reports last week picked up on the fact that TBI can lower people’s inhibitions, including Vermont Public Radio, the Burlington Free Press and Seven Days. That’s why I placed my original column in the context of Ken Picard’s May cover story, “Continuing Ed,” which not only examined Flanagan’s odd behavior under the Golden Dome, but the impact TBI can have on a person’s daily regimen. Walking barefoot or sorting candies by color are certainly not crimes. But masturbating in front of other people after being asked to stop? That’s different. To date, Flanagan’s Y accuser — Tiki Archambeau — has not filed charges with police. The Burlington Free Press and Vermont Public Radio were the only media outlets that failed to give Seven Days credit for breaking the YMCA story or being the first to report publicly on Flanagan’s “peculiar” behavior in the Statehouse. Ah, to be marginalized. And to think Seven Days readers gave VPR a Daysie for best radio station. The Associated Press in Vermont didn’t bother to, er, touch the topic. Not even a rewrite of another outlet’s take. That means the story never made it to smaller dailies and radio stations in Vermont, unless their editors took the time to rewrite the story and source another outlet. Vermont’s correspondent John Curran said the AP doesn’t comment on its news-gathering decisions. Both WCAX and the Freeps made a point of mentioning Archambeau had been an officer in the city’s Progressive Party. Huh? IMHO, that has about as much to do with the story as the fact that Flanagan is gay. A sloppy editorial in the Freeps on Sunday contained a half-dozen errors or so. It identified Archambeau as a former Burlington city councilor — he wasn’t. It also noted that Flanagan was running for lieutenant governor in 2012. Um, the next election is 2010, folks. Nothing like calling for “clarity” in your editorial when you can’t even get your facts straight. I know times are tough, but proofreaders are worth every penny. Flanagan says he is rethinking his bid for lieutenant governor. He’ll wait until after next year’s legislative decision, he told the Freeps. Smart move. He’s keeping his campaign website active, I see. Just in case. Flanagan is working out in another gym, Archambeau is on vacation, and the media are likely to go on looking the other way as they always have when it comes to Flanagan — or any well-liked politician with an uncomfortable story to tell. YMCA President & CEO Mary Burns wouldn’t say whether the case was closed, ongoing or in abeyance. “It’s an internal, administrative matter, so we don’t make the results of our investigation public,” said Burns. As I noted in the first column, I hope the Y incident is a wake-up call to Flanagan’s friends and family. Not because it was one, isolated allegation, but because it was a series of incidents corroborated by several patrons and a former staffer. These are tough questions to handle, by voters, the media, fellow senators and Flanagan himself. But as Picard pointed out in his original story, someone has to ask them. Especially of a guy who would be governor. Bernie “Unfiltered”— Sen. Bernie Sanders and filmmaker Robert Greenwald have teamed up to create “Senator Sanders Unfiltered,” a roughly two-minute online “TV show” in which Sanders offers an unscripted take on major issues facing the country. The inaugural episode of “Senator Sanders Unfiltered” was launched Monday. In the future, each new show will air on a Thursday. It begins with a TwitVid question from a viewer. This week’s asked how Sanders felt about Wall Street bankers seeking hundreds of millions of dollars in bonuses from taxpayer bailout money. Sanders is urging regulators to fire some of Wall Street’s top CEOs, not reward them with more taxpayer money. Greenwald said Sanders was a perfect pol for this experiment. In fact, Sanders is the first U.S. senator to release a weekly online show. Media Notes — More changes at the Burlington Free Press —and we’re not just talking about the return of the “broadsheet” or that weird photo essay on Sunday demonstrating how Malawians chase, kill and eat mice. Features Editor Sarah Long is leaving the paper and taking a job back in her hometown of Philadelphia. Melissa Hart, who has been the shop’s sole graphics designer since her boss Deena Murphy was laid off in July, is quitting. In short, the Freeps is hiring! Speaking of trends — It’s hard to keep a newsguy out of print. Alden Pellett’s online Vermont daily news “paper”— aptly titled Vermont Daily News — continues to add content and boost readership. 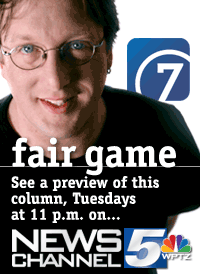 Meanwhile, Pellett tells “Fair Game” he’s getting quotes to see how much it would cost to print a monthly, or bimonthly, magazine, too. Finally, congrats to this year’s winners in the Daysie media categories. I was in some pretty good company, and appreciate the kudos for being named “best print journalist.” Aw, shucks.